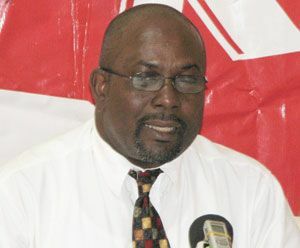 Jack, who rose to the post in 2005, taking over from long standing President Lenox John, confirmed to SEARCHLIGHT last Tuesday afternoon that he will be seeking re-election. Jack told SEARCHLIGHT that on the basis of his track record, he deserves another term. â We have been able to complete all our competitions, within the last year, except the womenâs Knock Out, and we have been able to do this despite the challenges of the problems of the availability of playing fieldsâ, Jack said. The Cricket boss is also pinning his re-election of the associationâs training progamme initiatives. âWe have been able to put together a team of coaches, which is really working, where you can call on anyone, to fill positions on national teams,â Jack said was one of his Executiveâs major achievements during its last two year tenure. He said that this is one of the pillars of his Executiveâs operations and one that will be strengthened once re-elected. âWe have already identified persons like Deighton Butler and Orlanzo Jackson as those we are looking to include among the team of coaches,â Jack added. Jack, who was re-elected unopposed in 2009, said he is welcoming any challenges this time around. âI have no problem who wants to run against me, it is a democratic process,â Jack, a former Windward Islands Chairman of selectors, said. Jack said that he was aware of the talks making the rounds that a few persons have expressed an interest in opposing his presidency. He re-affirmed his stance that he will not be entering the elections with any team for the current Executive to be return en bloc. âI believe in inclusiveness, and entering the elections as a team, can be divisiveâ, the SVGCA President reiterated. Apart from Jack, the outgoing Executive is First Vice President- Elson Crick, Second Vice President Selwyn Allen, Treasurer- Daniel Mc Millan, Secretary- Samuel Holder; the Assistant Secretary is Thaddeus Seymour, and Committee Members, Calvin Glasgow, Roger Davis, Cecil Charles and George Byron. Postponed from last Saturday, the AGM will hear and discuss the minutes of the last General Meeting, the Executive Report and the Audited Financial Statement and any other business pertinent for discussions.